When we use the word "devices", we mean computers, smartphones, tablets and all other devices with internet access. Cookies are small files containing letters and numbers that are placed on your device when you visit our website. Because a cookie is stored on your device, the website server can recognise your device. A cookie has a certain validity period which starts on the moment it is stored on the device you use, and may be renewed by a new website visit of you. After the validity period has lapsed, the cookie will be deleted. The following three categories of cookies may be used via our websites: (i) functional cookies, (ii) analytics cookies, and (iii) third party cookies. Please be aware that we make every effort to respect your choices. However, there is the possibility that not all cookies are included in this policy. Functional cookies enable you to move around our websites and use its features, record information about choices that you have made, and tailor the websites to your needs. Without these cookies, we will not be able to provide certain features, such as remembering details you entered and saving your preferred language. For as far as these cookies are used for the sole purpose of facilitating communication to your or are strictly necessary to provide services requested by you, they will also be used without your consent. However, you may block them by changing your browser settings. Analytics/statistical cookies help to improve the performance of our websites, providing a better user experience. Via these cookies, we obtain information about the quality and/or effectivenessof our services. It helps us to understand how our visitors use our websites, which enables us to improve how we present our content to you. For as far as these cookies have no or little impact to your private life, they will also be used without your consent. However, you may block them by changing your browser settings. Different sorts of third party cookies are used via our websites. In the first place, social media cookies may be placed to allow you to link to us on and share our content via social media (e.g. Facebook). In addition, cookies may be placed that enable personalized advertisements (Google DoubleClick) and cookies to further analyse your website usage (Google Analytics). These third party cookies are only placed with your consent. Third party cookies are placed by the relevant third party provider. We have limited knowledge and control over these cookies, the data recorded using these cookies, and the purposes these are used for. The third party providers will use the gathered information for their own purposes, such as to recognize and track you across websites on the internet.You should check the relevant third party cookie provider's website for more information about these cookies. Cookies for which your consent is required by law, will only be used via our websites with your consent. You provide your consent by clicking through from the landing page without adjusting the cookie settings. Please note that if you decide to block cookies, you may experience a loss of functionality of our websites. Furthermore, please note that it is not possible to retain your cookie settings between different browsers and devices. Anonymous cookies that allow visitors to navigate around skyteam.com, use its features and access secure areas. The information gathered by these cookies cannot be used for marketing purposes. If the use of this type of cookies is not allowed, various parts of skyteam.com cannot be used. Anonymous cookies that help SkyTeam improve its website. These types of cookies collect information about how visitors use skyteam.com, for instance about most visited pages, or the number of error messages shown. An example of this type is WebAnalytics cookies. Anonymous cookies that allow skyteam.com to remember visitor choices and preferences. Based on this information, skyteam.com can show more relevant information to individual visitors. Examples of data gathered are country and language preferences. 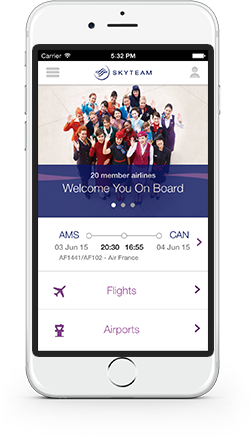 Prevent SkyTeam from remembering your preferences to not use or be shown a specific feature. When visiting skyteam.com you agree by default that SkyTeam places cookies on your device.